“I ROBOT . . .THE STORY OF THE RISE OF THE MACHINE AND THE DECLINE OF MAN, WHICH PARADOXICALLY COINCIDED WITH HIS DISCOVERY OF THE WHEEL. 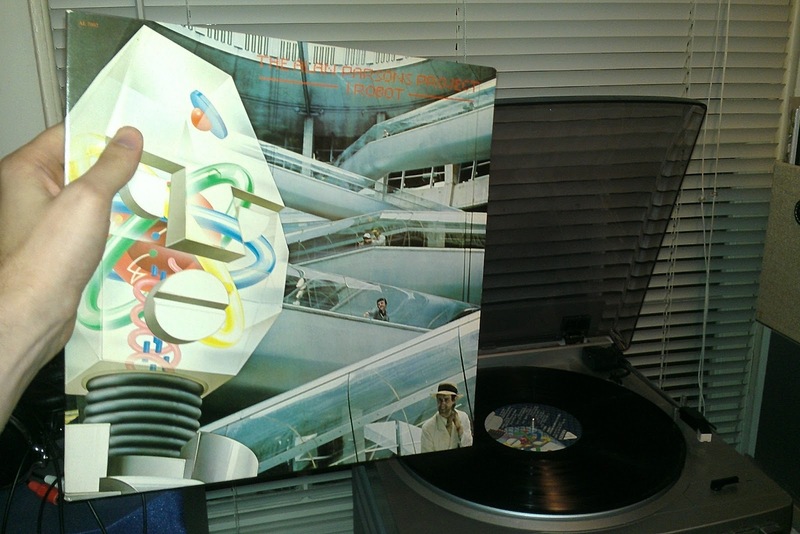 . .
I’ve never listened to the Alan Parsons Project–well, hadn’t. This, of course, changed that. I actually own three of their albums on vinyl (this one, The Turn of a Friendly Card and Pyramid, both of the others being released after this one), but this is really just due to the doubles still sitting in my father’s collection of 8,000 records. I was allowed to peruse these doubles and steal away any I deemed fit. We’ll see more of them (plenty far more obscure) later, but this was the one where I was able to withdraw numerous albums from a group I had never listened to. We’re rocketing along nicely through a variety of physical types of releases, as we’ve already covered one picture disc, one combination double-LP and coloured vinyl, and now we have our first gatefold album. Of course, this was from a discarded pile of duplicate albums, and many are not without their flaws of one kind or another. This particular album had its gatefold thoroughly stuck together in the center and is now quite thoroughly disfigured internally, but remains in large part legible despite this. The Alan Parsons Project were a progressive rock band, with most of the baggage (or benefits) that accompanies that label, I’ve found. The album opens with “I Robot,” which is very reminiscent of period electronic music like Synergy (about whom I will talk much, much later, considering where they are–he is–in the alphabet) and Tangerine Dream of the same time period. Now, if you don’t know Synergy or Tangerine Dream (or any other mid-70s electronic music) let me do my best to describe it for you: sparse, wholly and unmistakably electronic music, where synthesizers and keyboards are used not to emulate known instruments, but to create their own noise and sound. It sets the stage for exactly what progressive rock means to both fans and detractors: heavily instrumental music dominated by slower paces, lengthier track times and unabashed use of the electronic. The surprise comes from the track it leads into: “I Wouldn’t Want to Be Like You,” which I actually recognized quite readily from the dim recesses of a youth spent listening to my father’s choices of music and the radio, as determined by classic rock, oldies and “college rock” stations. The song fades in from a thudding bass and taps on the hi-hat alongside spacious keyboard chords that make it sound like the music from a 1970s cop movie at night designed to build tension. A guitar fades in over this with the palm-muted and emphatic strums many would associate with the intro to Survivor’s “Eye of the Tiger.” Once the song kicks in and Lenny Zakatek’s vocals begin, it’s all riding over a very clear disco beat, signified by what many call the “pea-soup” drum, which is onomatopoeia for the hiss of a hi-hat leading quickly into a drum hit. Once you hear it and think of “pea soup,” you’ll probably understand. “Some Other Time” follows this and is almost like one of the spacey, folk-esque singers of the 1960s before it moves into the chorus, underscored by a triumphant synthetic horn section. The drums and bass fill out the sound of the verses and the song continually builds and falls away to create a song that has the highs and lows of a soundtrack, which it resembles like much of the album. Peter Straker adds a completely different vocal style to the song, which is weighty with its faux brass section. A lot of the album has hints of both 1970s-styled soundtracks and various classic progressive rock bands, hints of things like “I Talk to the Wind” from King Crimson’s debut and its more pastoral approach to the genre as well as Pink Floyd’s Dark Side of the Moon, and even earlier material in Jack Harris’s vocals on “Day After Day (The Show Must Go On)” which has the airy stylings of Roger Waters’s vocals on Meddle‘s “San Tropez.” The Dark Side connection is unsurprising, considering Alan Parsons himself, half of the core songwriting duo of the group (the other half being Peter Woolfson), engineered that very album. I’ve been known to let progressive rock albums drift in one ear and out the other sometimes, especially the keyboard-oriented varieties, but the album never meanders or drifts off too far into obvious or laughable pretension, even if the concept doesn’t necessarily jump out. It stays comfortable and interesting, until it ends with the rather excellent instrumental, “Genesis Ch.1, V.32” which has stable, steady, drums marching the song off into the distance as if over end credits of a film, while Ian Bairnson’s electric guitar uses sustained bends and firm marches between single strings on clear frets to push the album and the song in the same direction, choral voices (one of the elements most indicative of Parsons’s time with the Floyd) lend it all a sort of drama that is perfectly faded to end the album with the march onward of time, into the theoretical future of a robot-dominated world, inexorable and fated, but not clearly totalitarian or sad so much as a new verse or chapter–which, of course, the title itself implies, being named for the verse of Genesis Ch. 1 that does not (yet) exist in its known 31 verse form. I’m actually quite pleased: I was reminded somewhat of the Bob Welch era of Fleetwood Mac, which appeared between Peter Green’s more experimental dominance of the group and the more popular and famous era of Buckingham/Nicks. It straddled that line of experimentation and pop happily without falling too much a victim to either, as this album does.